These resources have been produced by FISSS to support employers in their work to develop a valid, reliable assessment approach for an Apprenticeship standard. developing the subsequent detailed assessment strategy (stage 2). These resources will also be useful for employer group facilitators and support organisations. Employer groups will have different levels of experience of assessment. 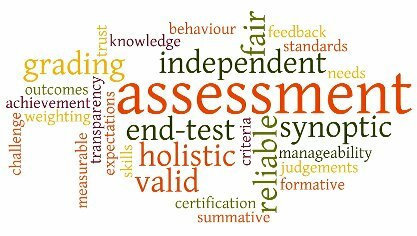 Groups that have little experience of developing assessment may benefit from an early reading of the document Understanding assessment in Apprenticeships which provides an introduction to key terms and concepts, while more experienced groups may prefer to dip in and out of the resources as needed. Important: These resources should be used in conjunction with the latest guidance issued by BIS and the Skills Funding Agency. If you have any questions about these resources or need further support, contact info@fisss.org. Use this resource map to access individual tools. Alternatively, you can download all the tool documents and guidance videos together as a single zip file: FISSS-Assessment-Resources.zip (30M). These documents are referenced throughout the assessment resources. Assessment resources: An introduction (PDF) A short introduction outlining the context behind these assessment resources. Case study: The Initial Police Learning and Development Programme (PDF) This short, non-Apprenticeship case study looks at one approach to assessing skills, knowledge, and behaviours has value in its own right and is used to inform some of the worked examples offered in some of the tools. Case study: Private Pilot Licence (PDF) This short, non-Apprenticeship case study looks at an end-test approach to assessing skills, knowledge, and behaviours has value in its own right and is used to inform some of the worked examples offered in some of the tools. Compendium of assessment delivery arrangements (PDF) Describes a range of assessment delivery arrangements – the methodologies employed, cost considerations, level of independence/impartiality, and procurement and quality issues. Compendium of assessment methods (PDF) Describes a range of assessment methods – how the method works, what the challenges are and the issues to be addressed when using that type of assessment. Understanding assessment in Apprenticeships (PDF) This short introduction to the key terminology and concepts of assessment is aimed at employers who are new to developing assessment. Stage 1 activity takes place during development of the standard and involves the lead employer group establishing an initial understanding around the range of assessment methods and opportunities that will be appropriate for assessing an apprentice against the standard. The tools offered here will facilitate a review of your existing assessment processes and support early mapping of appropriate assessment methods to the standard to form your indicative assessment approach. TOOL 1: Where are we now? (MS Word document and guidance video) Before you start any development work on the assessment approach for an Apprenticeship standard, you need to understand existing assessment practice in the sector. This tool offers two ways of achieving this understanding. TOOL 2: Choosing your assessment methods (MS Word document and guidance video) This tool provides an insight into different assessment methods, their strengths and weaknesses and fitness for purpose. It is a key tool to inform choices and decision taking about assessment methods. Use as a formative stimulus for discussions by an expert group. TOOL 3: A development template for an indicative assessment approach (MS Word document and guidance video) This tool will help you map the components that make up an indicative assessment approach for your standard, to check that the chosen approach is sufficiently comprehensive, and to ensure that there are no gaps in coverage of the standard. TOOL 4: Checklist for the indicative assessment approach (MS Word document and guidance video) A short checklist that will help you ensure the completeness of your chosen indicative assessment approach. Stage 2 begins once the Apprenticeship standard has been approved by BIS. This stage of development work focuses on building the implementation detail for the assessment approach. This work will be closely linked to the development of the associated Apprenticeship training programme and to the necessary governance arrangements that, together, allow the Apprenticeship to go live. The tools offered for here will help you identify partners to support your stage 2 development work (or outsource, if appropriate), to move the standard forward into a competency scaffold, and to build a detailed and valid assessment approach that is compatible with the needs of your sector’s employers. TOOL 5: Initial questions for stage 2 development work on assessment (MSWord document and guidance video) An agenda-building tool that helps you look ahead and plan the development work that needs to be undertaken during this stage. TOOL 6: Commissioning an assessment service (MS Word document) Guidance, initial questions, and a checklist to help you commission an assessment service where you find that you are unable to undertake all of the detailed development work for the assessment strategy yourself. TOOL 7: Stakeholder mapping (MS Word document) This tool can be used at any stage of the development work (including stage 1) to identify the key partners that you might work with. TOOL 8: Building a competency scaffold (MS Word document and guidance video) Before the detail of the assessment approach can be undertaken, each element of the standard will need to be broken down into a competency scaffold that can generate the questions that must be asked so that measurable judgments of competence can be made to judge and record progress. This tool will help you do this. TOOL 9: Building the assessment approach (MS Excel spreadsheet and guidance videos) This spreadsheet-based tool matches the competency statements from the Apprenticeship standard with the most appropriate assessment method. TOOL 10: Fitness check for end-testing (MS Excel spreadsheet and guidance videos) This spreadsheet-based tool will help you achieve a balanced alignment between the assessment methods used on-programme and the end-test. partners (MS Word document) This tool will help you turn your assessment plans and strategy into a ‘specification’ that can be put out to tender for assessment providers. TOOL 12: Completing the assessment approach (MS Word document) Provides a guide on what needs to go into the final assessment approach, drawing the outputs from all the stage 2 tools. The completed approach will require support from employers across the sector and sign-off by BIS.